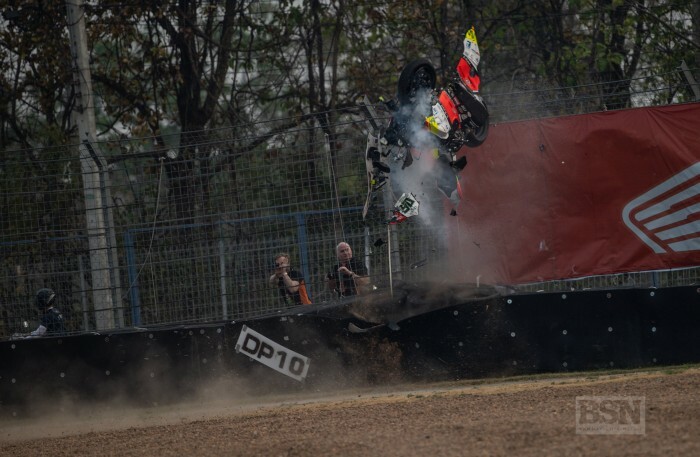 Goeleven Ducati’s Eugene Laverty was forced to jump off his Panigale V4 on lap three of the opening Buriram WorldSBK race as he suffered brake failure going into the final corner. The Irishman had settled into a top ten slot after Superpole and was chasing Chaz Davies and Marco Melandri but had to bail out after trying three times to pump some pressure into his front brakes. “It’s very disappointing to end race one in this way after such a promising weekend. In Superpole we made a good lap time to qualify in 8th position and I was feeling optimistic of a great result in race one,” said Laverty. On lap three I arrived at the final corner with no front brake. I tried to pump the lever three times but no brake pressure arrived and so I had to jump off the side of the bike.